Shawn Wesley Abner was born on June 17, 1966 in Hamilton, Ohio. The six foot one right handed hitting Abner was a high school baseball & football star in Mechanicsburg Pennsylvania, He set many school records there and had his uniform number 16 retired in both sports. 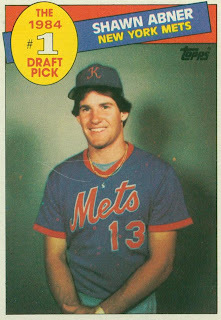 In his 1984 sophomore year, Abner became a number one draft pick, the first pick overall selected by the New York Mets. The scouts said he was a “can’t miss” prospect, just as the recent Mets previous number one draft pick selections Dwight Gooden & Daryl Strawberry. Interestingly that year the Mets had first attempted to sign Mark McGwire but his family was unwilling to commit to a pre draft deal. The organization was unwilling to commit to McGwire not knowing if he would eventually sign a deal, so they chose Abner. In 1985 at the A ball Lynchburg he hit .300 with 16 HRs 30 double 11 triples & 89 RBIs winning the Carolina League MVP award. He then dropped to off to a .266 average at the AA level but was still considered a highly touted prospect. 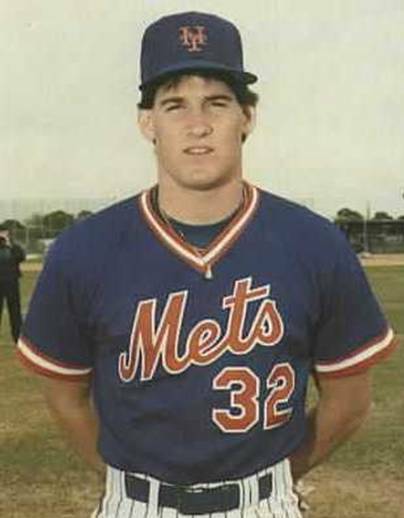 After winning the 1986 World Series, the Mets made their big league team outfield even stronger, by acquiring Kevin McReynolds from the San Diego Padres. In that trade they surrendered the hot prospect Abner along with rookie star Kevin Mitchell & another highly touted prospect the Bronx's own; Stan Jefferson. In the Padre organization, Abner hit .300 sat AAA Las Vegas, in 1987, earning a September call up, where he debuted against the Braves in Atlanta on September 8th. In 16 games that month he hit .277 with two HRs & seven RBIs. Abner struggled the next few years as well going between the minors & the big leagues. He did not turn out to be the Padre outfielder of the future like expected. In 89 games in 1988 he only hit .181 with two HRs & five RBIs. He hit under .200 again in 1989 (.176) playing in just 57 games. By 1990 he raised his average up to .245 seeing action in 91 games but showed no power with just one HR in 184 at bats. In 1991 he was hitting only .165 in July & was traded to the California Angels for Jack Howell. His stay was brief as he was released at Spring Training 1992 then signing with the Chicago White Sox. In 1993 Abner had his best year batting .279 with one HR, ten doubles & 16 RBIs in 97 games played as a reserve outfielder. Then a knee injury shut him down ruining the rest of a once promising career. In 1995 he was back in the Mets organization attempting to rehab the injury at AAA Norfolk. He batted .258 there in eleven games with no extra base hits & one RBI. After six career seasons he batted .227 with 191 hits 11 HRs 39 doubles a .269 on base % & 71 RBIS in 393 games played. Retirement: Since his playing days he has worked at a beer distributor in Mechanicsburg, Pennsylvania. His two sons have played high school football there as well.